Big Brown Bat (Eptesicus fuscus) – Big brown bats (Eptesicus fuscus) are considered “large” for an American bat. They have brown to glossy copper-colored fur on their back with the belly fur being lighter. Their ears are small, rounded and black in color as are their wing membranes and tail. Their lips are fleshy and their nose is broad for the size of their face. Brazilian Free-Tailed Bat (Tadarida brasiliensis) – A member of the Molossidae family, the Brazilian free-tailed bat has the characteristic mouse-like tail protruding beyond the flight membrane stretched between its hind legs. Relatively plain when compared to many bats, this species has brown fur, large ears that are nearly square, and a strongly wrinkled upper lip. However, it is superbly adapted to its aerial lifestyle, having long, narrow wings with pointed tips to enable very fast flight, and long hairs on the toes to judge flight speed and turbulence. The hind legs are short and powerful, making this bat an excellent climber. Eastern Red Bat (Lasiurus borealis) – Eastern red bats are North America’s most abundant “tree bats.” They are found wherever there are trees east of the Rocky Mountains from Canada to as far south as central Florida. Eastern red bats roost right out in the foliage of deciduous or sometimes evergreen trees. Despite their bright red color, these bats are actually rather cryptic, looking like dead leaves or pine cones. They are perfectly camouflaged as they hang curled-up in their furry tail membranes, suspended from a single foot, twisting slightly in the breeze. For the most part, red bats are solitary, coming together only to mate and to migrate. Females even roost singly when rearing young. Unlike most bats, Eastern red bats often give birth to twins and can have litters of up to five young, though three young is average. Eastern Small-Footed Myotis (Myotis leibii) – The eastern small-footed bat is a species of vesper bat. It can be found in Ontario and Quebec in Canada and in the Eastern United States. It is among the smallest bats in eastern North America and is known for its small feet and black face-mask. Evening Bat (Nycticeius humeralis) – Nycticeius humeralis is a small, dark brown bat with black wings and ears. Its fur is bicolored above (dark brown at the base and dull grayish brown at the tips) and lighter brown below. The tail is furred only at the base of the upper side. It has a forearm length of 34-38 mm and weighs 8-14 g. The evening bat is very similar to the big brown bat due to its fur color and broad muzzle. However, it is much smaller (forearm less than 40 mm) and does not have a keeled calcar. The evening bat’s rounded tragus distinguishes it from all other small bats except the eastern pipistrelle, which has tri-colored rather than bicolored dorsal fur. The evening bat also has just two upper incisors instead of the four typical of all myotis. Gray Bat (Myotis grisescens) – The gray bat is an endangered species. Endangered Species are animals and plants that are in danger of becoming extinct. Threatened species are animals and plants that are likely to become endangered in the foreseeable future. Identifying, protecting, and restoring, endangered and threatened species is the primary objective of the U.S. Fish and Wildlife Service’s endangered species program. Hoary Bat (Lasiurus cinereus) – The body of hoary bats is about the size of a fat mouse. Hoary bats weigh 20 to 35 g. The length from the tip of the nose to the end of the tail is 13 to 15 cm. The wingspan is 43 cm. These bats have blunt, rounded noses and small, beady eyes. The ears are short, thick, broad, and rounded. When laid forward they do not reach the nostrils. The hindfoot has thick fur on the upper side. The thumbs are long. These bats have four mammary glands. Indiana Bat (Myotis sodalis) – The Indiana bat was listed as endangered in 1967 due to episodes of people disturbing hibernating bats in caves during winter, resulting in the death of large numbers of bats. Indiana bats are vulnerable to disturbance because they hibernate in large numbers in only a few caves (the largest hibernation caves support from 20,000 to 50,000 bats). Other threats that have contributed to the Indiana bat’s decline include commercialization of caves, loss of summer habitat, pesticides and other contaminants, and most recently, the disease white-nose syndrome. Little Brown Bat (Myotis lucifugus) – The Little Brown Bat is typically found living around swamp lands. They have been found living in Alaska. They are also well known in areas of Georgia and Arkansas. The largest recorded number of them in the United States happens to be in New Hampshire. The only states where they aren’t known to live include Texas, Florida, and Mexico. This is strange to experts though since those are humid regions and these bats certainly do live the humid areas. The Little Brown Bat is the one that people are the most familiar with. There are more of them in the United States and Canada than of other species combined of bats. Those that live in colder regions including Alaska take part in hibernating during the winter. This can take up six months per year, so they aren’t always seen in the high numbers that are really out there. Northern Long-Eared Bat (Myotis septentrionalis) – According to the U.S. 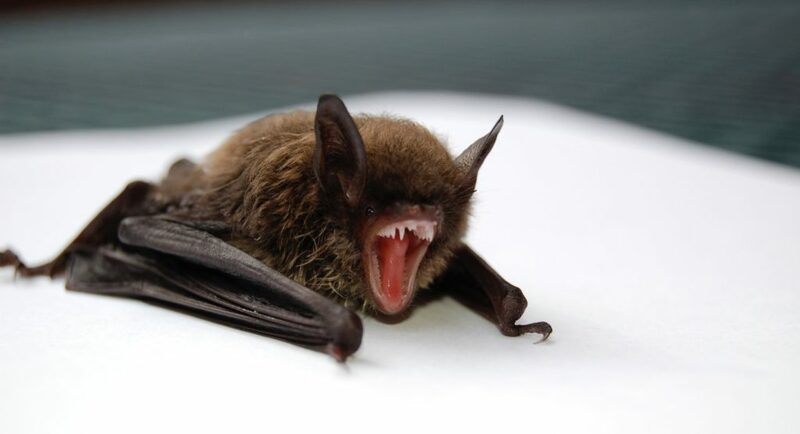 Fish and Wildlife Service, the primary threat to the existence of the northern long-eared bat is a pandemic fungal disease called white-nose syndrome, a disease known to infect the muzzle, ears, and wings of hibernating bats. In the Northeast, the species has declined by up to 99 percent from pre-white-nose syndrome levels at many hibernation sites. Infected bats often display abnormal behaviors in their habitats, such as movement toward the mouth of caves and daytime flights during winter. White-nose syndrome has and continues to spread within the range of the northern long-eared bat. No other factor or human activity imposes an existential threat to the species. Rafinesque’s Big-Eared Bat (Corynorhinus rafinesquii) – Rafinesque’s big-eared bats are known to form nursery colonies in large hollow trees. Hollow tree roosts provide stable internal environments, protection from predators, and often contain well-insulated areas that form the hot-air traps essential for rearing young. These bats range throughout the southeastern United States from southern Virginia south and west to eastern Texas and northward along the Mississippi River valley to southern Indiana. Their range most closely approximates the historical range of great cypress swamps, indicating that they may have formed a traditional reliance on these areas as roosting and/or foraging sites. Seminole Bat (Lasiurus seminolus) – Lasiurus seminolus is a medium-sized bat with deep mahogany fur which is frosted at the tips, giving the bat a distinct reddish-maroon hue, unlike the reddish orange of eastern red bats. The Seminole bat has a furred tail membrane, well furred to the tip of its tail. Its fur extends along the underarms to the wrists, ending with distinctive white patches on the wrists and shoulders. This bat has a forearm length of 35-45 mm and weighs 8-15 g. It can best be distinguished from the red bat by its mahogany color. Hoary bats are much larger (forearm 50-57 mm) and yellow bats lack white wrist and shoulder markings. Southeastern Myotis (Myotis austroriparius) – The southeastern myotis weighs 5-8 g. Its diet consists predominantly of insects. All species of the genus Myotis, including the southeastern bat, rest by day and forage at night. They often hunt and feed over water. The feeding flights usually alternate with periods of rest, during which the bats hang to digest their catch. The southeastern bat has a wingspan of about 9-11 inches. Pelage varies from gray to bright orange-brown, with females generally being more brightly colored than the males. Southeastern bats are unique among Myotis of the United States in the production of twins; all other Myotis females usually produce one baby. Tri-colored Bat (Perimyotis subflavus) – The tri-colored bat (formerly known as the eastern pipistrelle) was, historically, one of the most common species of bats found throughout the eastern forests of America – from Nova Scotia and Quebec, south throughout the east coast of Mexico into northern Central America. But, surprisingly little is known about its daytime summer or maternity roosts. These bats are among the first bats to emerge at dusk each night, and their appearance at tree-top level indicates that they may roost in foliage or in high tree cavities and crevices. Virginia Big-Eared Bat (Corynorhinus townsendii virginianus) – This bat is of medium size (total length= 90-112 mm, and weight 9-12 grams) with huge ears joined across the forehead. They have elongated nostril openings, soft long fur, with the dorsal hairs dark, brown at the tip. Females gather from diverse hibernacula during April and May to form maternity colonies in warm caves. At rest, the ears are coiled slightly and lie along the neck. It is one of only two Virginia bat species which roost in caves in the summer. In the winter they commonly roost singly or in small groups.This is not a migratory bat,although, if disturbed, the entire colony may move to an alternate site. Lifespan is 16 years. These bats are designated as state and federally endangered mainly due to their small population and limited habitat and distribution.